Japan's monetary experiment is truly unprecedented, both in size and scope. Not only is the overall central bank balance sheet growth accelerating, but the assets purchased are not just government securities. The Bank of Japan is buying up REITs and stock ETFs to prop up both asset classes. The amounts are still relatively small, but the buildup is quite rapid. The nation's stock market is now up over 75% over the past year as investors celebrate the massive stimulus, BOJ's direct purchases of ETS and REITs, and a rapidly depreciating yen. Japan's economy is quickly responding to this aggressive policy, with analysts frantically revising growth forecasts. Goldman: - Strong Q1 growth, technical upward revision to our FY2013 forecast Jan-Mar real GDP growth came in at +3.5% qoq annualized, substantially outpacing the market consensus forecast of +2.7%. Consumption was the driver rising +3.7%, while exports turned positive for the first time in four quarters. We raise our FY2013 real GDP forecast to 2.8% growth, from 2.5%, based on the strong GDP numbers for Jan-Mar. 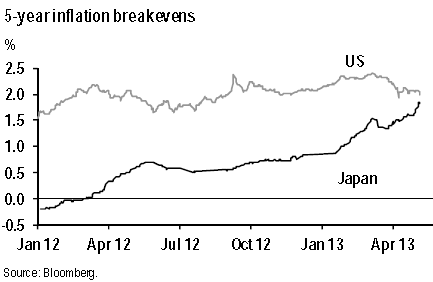 The Bank of Japan's biggest achievement of course is pulling the nation out of the prolonged deflationary spiral. Market-implied inflation expectations have risen sharply over the past year, quickly approaching those in the United States. This is a great lesson for central banks around the world. If much needed structural changes fail or competitive pressures become too great, let you central bank resolve the situation. Just as the ECB "saved" the EMU with its OMT bond backstop policy, Japan is showing that highly aggressive central bank actions can work beautifully in the short term. But what happens in the long run some may ask? Don't worry about that, because as Keynes famously pointed out, "... this long run is a misleading guide to current affairs. In the long run we are all dead."